I’ve gone for a jackfruit recipe this week because I recently jumped on an offer for 24(!) cans of the stuff, so really need to get through it. I initially thought of making a jackfruit chilli-sin-carne. However, refreshed from my holiday last week, I fancied a challenge. Chilli-sin-carne, although delicious, is quite similar to other recipes already on this site. No, I wanted a departure from familiar ground. A departure that took me to Mexico (figuratively). What’s more, I was surprised by the dearth of high quality jackfruit burrito recipes out there. As a food blogger, I often have what I think is a brilliant idea only to find it has been done a million times before. No big names in the food blogging world have covered these. 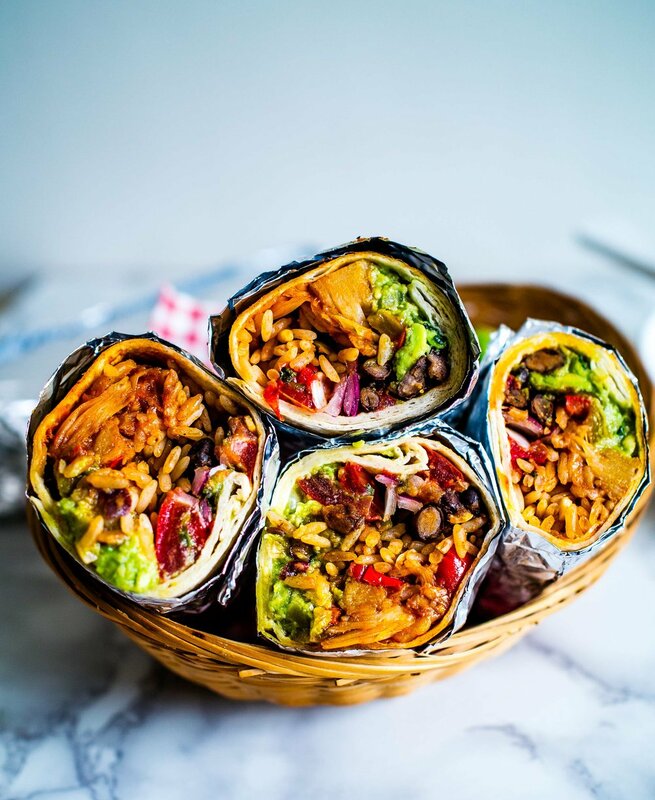 I haven't had much experience with burritos but, from the anecdotal evidence on google and Reddit, the difference between burritos and fajitas is that the burrito tortilla is made from wheat flour, instead of maize, and the presence of rice – hooray for carbs on carbs! To be honest, I quickly caught on to the appeal of burritos. With a couple friends at the ready as testers, I set up a full kitchen-counter station with bowls of BBQ jackfruit, peppers and onions, homemade refried beans, Mexican rice, guacamole and salsa, all next to a stack of warm tortillas. I enjoyed the batch production: you get into a flow, hands quickly learning the motions. And when you’re done you’ve got a pile of tightly wrapped foil packages of deliciousness. 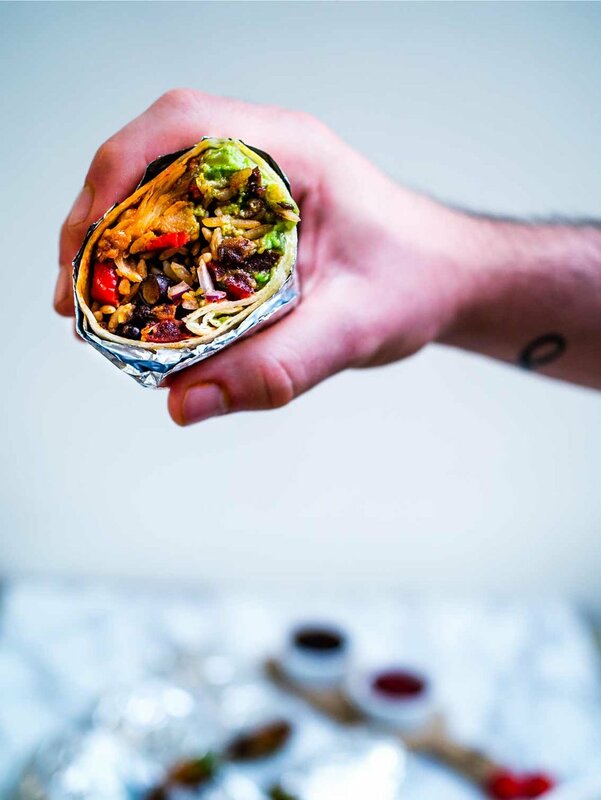 Most importantly though, these burritos tick pretty much every flavour box. Spiciness comes from cayenne pepper and fresh chilli, guacamole and refried black beans provide a creamy satisfaction and there’s a tangy-sweetness from the barbecue sauce. Textures vary wildly too, with crisp pico de gallo and nubbly Mexican rice. A bonus: I managed to figure out a way to make Mexican rice without too much hassle. I used tomato puree instead of crushing fresh tomatoes, and it worked like a charm, colouring every grain scarlet red. Mexican rice is not just filler; you dry-toast or fry the rice grains prior to boiling which adds an additional dimension of flavour. I hope you enjoy making these as much as I did. Perhaps I’ll have become a burrito wizard by the time I finish those 24 cans – or perhaps you, lovely readers, have some ideas I can test out for my mountain of jackfruit?! Put the diced tomatoes in a colander set over a bowl and sprinkle them with the salt. The excess moisture will start to drain out. Leave for 20 minutes minimum. Gently press the tomatoes to squeeze out more juice, then discard the juice. In a small mixing bowl gently combine the tomatoes with the onion, coriander, chilli and lime juice. Set aside. In a large saucepan, fry the onion and peppers in the oil for 10 minutes over a medium-high heat. Add the smoked paprika, cumin, cayenne pepper, dried oregano, black pepper and mustard seeds, stir well and fry for 5 more minutes. Add the jackfruit and mix until it's coated. Now add the tomato ketchup, soy sauce, cider vinegar, treacle and sugar and stir well. Bring to a boil, then reduce to a low simmer and cook for 10 minutes. Set aside. Heat the oil in a non-stick medium saucepan over a medium heat. Add the rice grains and fry for around 7 minutes, stirring occasionally, until golden brown. Add the garlic, tomato puree and cumin, stir well and fry for a few more minutes. Add 1¾ cups water and bring to a boil. Turn down to a low simmer, cover, and cook until the water has been absorbed by the rice (about 15 minutes). Taste it to check the rice is done. If not, add a little water and continue to cook until done. Heat the oil over a high heat in a small or medium frying pan. Fry the garlic and cumin seeds for 2 minutes, then add the beans and smoked paprika. Fry for 1-2 more minutes, add the salt, and set aside. Put the avocado in a small mixing bowl and use a potato masher or fork to mash until a few chunks remain but it is mostly smooth. Mix in the onion and salt. Drizzle the lime juice over the surface of the guacamole to prevent it from browning. Mix in the lime juice at the last minute. Warm the tortillas slightly in the microwave or in a low oven. Spoon lines of jackfruit, rice, beans, pico de gallo and guacamole next to each other on a tortilla. Do not overfill it. Rotate the tortilla so the lines are horizontal to you. Fold the sides in first, hold them there with your fingers, then bring up the bottom flap over the fillings with both thumbs. 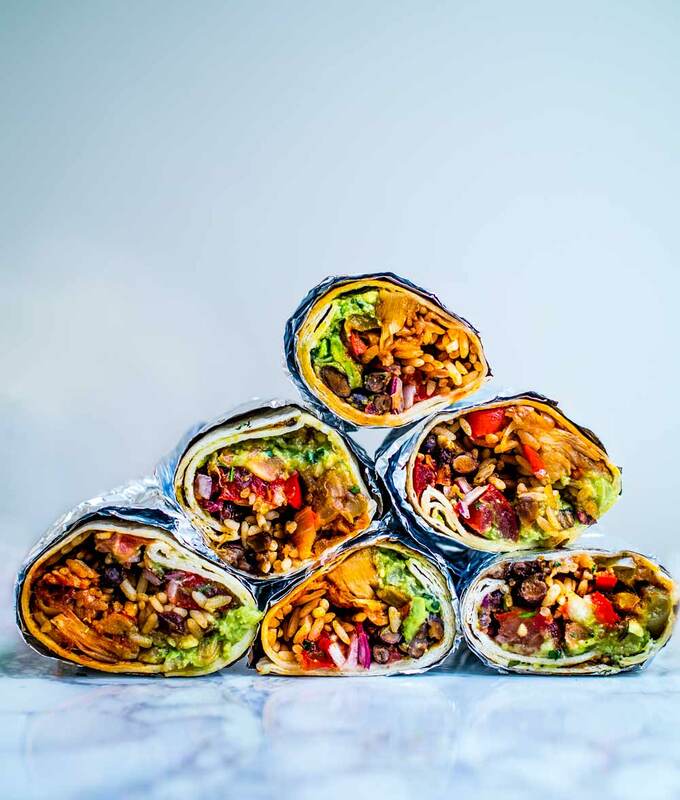 Pull the bottom flap taut over the fillings and sides, then roll forward, tightly and away from you, until the whole burrito is secured. If you like, rewrap the burrito in aluminium foil to keep the burrito warm. *this is an affiliated link. This means I receive a tiny commission (at no extra cost to you) which will go towards keeping this site alive! 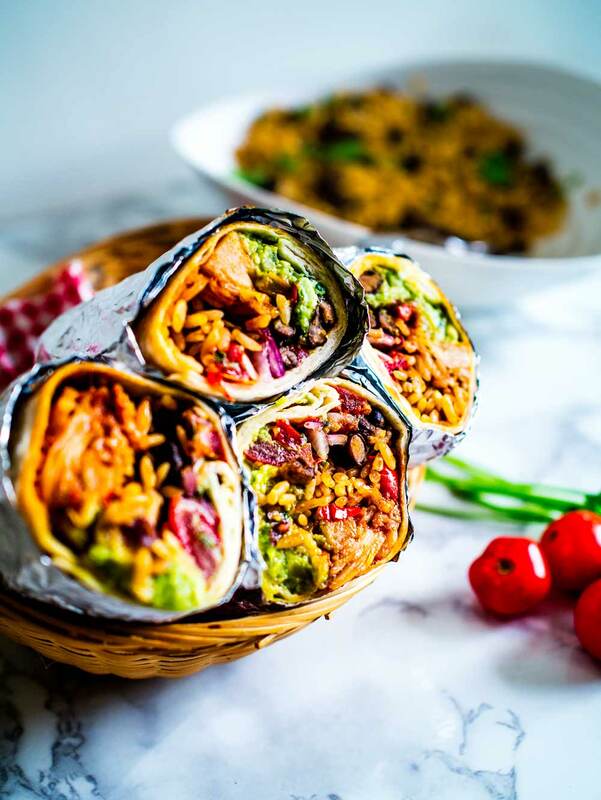 These epic vegan Jackfruit Burritos are filled with mexican rice, guacamole, refried black beans, pico de gallo and bbq jackfruit! Sumptuously satisfying and perfect to make over the weekend or as meal-prep!